It’s hard to find a book on spiritual parenting that can be used by any parent of any faith. A book that can be applied universally regardless of religion. But one book really stands out and it’s The Seven Spiritual Laws for Parents by Deepak Chopra. In fact, before that, Deepak wrote a highly successful book called The Seven Spiritual Laws of Success. Many readers wrote in and said as much as they liked the book, they wished they learned this when they were young. That gave rise to this book and it’s written for parents who want to teach their children about universal laws of success and happiness. Deepak said, despite the worship of material success, success depends on who you are, not what you do. He shared in this book what he did with his two children when they were growing up. The book is divided into two sections. First section is about what the seven spiritual laws are and the second is about practicing the laws with your children. The seven laws are extremely important for parents to teach their children as these laws put a person in touch with the mechanics of Nature. The more connected we are, the more we will enjoy the abundance of the universe. Children need simple language to understand the principles. There are two versions of The Seven Spiritual Laws for Parents: for adults and children. Fourth Law: Don’t say no – go with the flow. Honestly, when I went through the list, I felt so good and had the urge to read in detail what every law means. Aren’t these what parents need to teach the children? Not only are the laws important to the children but also to parents. Deepak stressed that if a child who has not learned to look for meaning in simple ways (such as teaching the kids about the seven spiritual laws from young) will one day have to try to find a purpose in life under much more difficult circumstances. Usually we postpone our search until our late teens or early twenties. 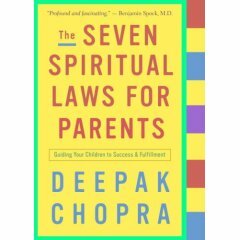 Deepak suggested that parents use every day in a week to teach each of the seven spiritual laws, starting from Sunday. Every day there are three things you can do with your children to teach a particular spiritual law. Encourage their unique talents and abilities. Invite them to perform an act of service. Of course, the book has a more detailed day-by-day program for the family – coupled with extremely clear explanation on certain subjects. In conclusion, Deepak said there’s one thing you cannot do without. It’s not love and it’s something deeper than love. The one thing you cannot do without is innocence. If you think you will be intimidated by self-help jargons in this 160-page book, you are safe. This book is easy to read and easy to understand. If you are a fast reader, you can finish the book within an hour! This is a great book to help parents to raise happy, successful children. And also to balance up our thirst for material possessions. If you are a self help junkie, there’s nothing new in this book and you might have read it before. But what makes this book different is it contains a section on how parents can teach children the seven spiritual laws. Click here to get a copy of The Seven Spiritual Laws for Parents: Guiding Your Children to Success and Fulfillment from Amazon.